Aku's SL Trek GTX is not the boot I was expecting. At two pounds, 15.5 ounces per pair (US 9.5), the SL Trek is light but certainly not ultralight. In fact, if you're looking for a light GTX hiker in the class of something like the Vasque Breeze, the SL Trek will likely perplex you. This is a beefy boot with a formidably stiff sole—stiff to enough to absolutely impact your stride. Based on its design and construction, I'd say the Trek feels a lot closer to an ultralight mountaineering boot than a lightweight, on-the-trail hiking boot. That's not necessarily good news if you just want a good trail boot, but it is noteworthy if you do a lot of off-trail hiking and you need more stability and durability than a typical light hiker offers. Also, though not compatible with new-matic (or semi-automatic) crampons, the Trek SL might work as a light, non-technical mountaineering boot. Does this kind of boot make sense? It might, depending on your needs. Certainly it's going to be overkill for most hikers on most established trails—even, I'd say, for hikers who carry heavy loads. It's not so much the Aku's weight that works against you as its stiffness, which does give a bit of that dreaded 'clunk' to your stride. There are reports that the sole will soften after a few weeks of use and loosen up a little, but frankly I'm not that interested in a boot that requires an extensive break-in period. On the other hand, in situations where on-trail stride isn't an issue, like desperate scrambling off-trail in those horrible Eastern Sierra drainages, the Aku looks a lot more appealing. The Aku's fit favors a higher-volume foot, especially in width. The toe box seems roomy—maybe too much so. The SL Trek's volume, for my low-to-medium volume foot, is about as much as I can handle. With the boot tightly laced, it just about closes enough to give a snug fit, but realistically this just isn't an ideal fit for my foot. I have to say I find the Aku SL Trek most intriguing as a possible replacement for my mountaineering boots in non-technical climbing situations. Without a toe lug for crampons, security just isn't going to be as good, but if you're not climbing exposed snow or ice, universal crampons will do just fine. 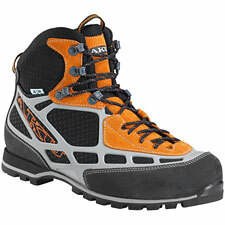 Pair strap-on crampons with the SL Trek, and you've got a light winter boot at a pretty competitive weight. For on-trail hiking, however, the Trek SL is just too much boot—at least for my taste.